Oswestry Show! All pix from Freja. 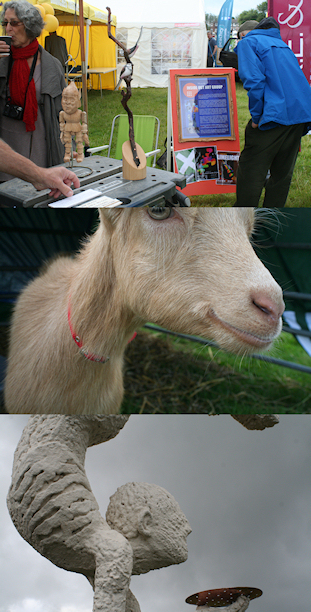 Thanks to everyone who helped make yesterday an excellent day at the Oswestry Show! A very big thank you to Louise Hudson and D.R.E. & Co. Accounting, who kindly offered us half their pitch after hearing me talk about Art Works at the Oswestry Chamber of Commerce meeting. Thanks to Jim Heath, Judy Greaves, Jas Davidson, Diana Baur, Rob Baur and Freja who helped get everything set up at a very early 8am in the morning. And thanks to all the Inside Out artists who stopped by and drew, painted, sketched and carved in front of the marquee. Particular thanks to Freja for the invigorating and delicious chocolate/coffee/rum fairy cakes – which vanished so fast I almost didn’t get any! Everyone was very complimentary about our set-up – and, I think, surprised at the link-up between an accounting firm and an art group. It was an extremely successful partnership – D.R.E & Co. got something interesting in front of their marquee, and Inside Out got a chance to exhibit at the show for free. Not only were we highly visible, and gave out loads of leaflets about the group and our projects – but we also came away with a handful of commissions: proof that if you get yourself out there and make yourself visible, that people will – and do – take an interest in you and your work. We all had a great day – despite the fact that at quarter to four, the heavens opened and we were hammered with rain and hail. More importantly, we had a very successful day, too. Thanks again to everyone who made it work – and let’s start making plans for next year! « Salon Art Prize – call for entries!